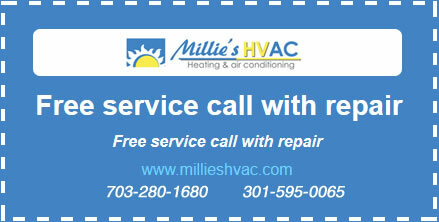 Millie’s Heating & Air Conditioning has been a trusted provider of quality Great Falls furnace replacement services for many years. We carry a great selection of furnaces for you to choose from, and our technicians have the skills and experience to put them in properly every time. So whether you know you need a new furnace or whether you want a professional opinion, be sure to give us a call today. There are several warning signs to watch for that will alert you that it could be time to replace your furnace. None of them necessarily mean that replacement is a necessity, but you will not know for sure until you consult a professional. For instance, if your furnace is not heating your home as effectively as it used to, it may be time to consider replacing it. Uneven heating is another sign that trouble is brewing that might warrant furnace replacement. You could also benefit from professional Ashburn furnace replacement if your furnace is more than 10 years old or if it requires frequent repairs. Newer furnaces are much more energy efficient than their predecessors, and a furnace that is breaking down often probably is not operating at maximum energy efficiency anyway. Improving your furnace’s energy efficiency by upgrading to a new model will let you start saving immediately on your monthly energy bill. No matter why you need to replace your furnace, it is best to do it sooner rather than later. So when you first notice any of the signs that your furnace is not working properly, be sure to call Millie’s right away. Our experts will come out and inspect your system to see what is causing the symptoms you are noticing and whether it would be better to make repairs or replace the whole system. If replacement is the best option for you, our Ashburn furnace replacement services are just what you are looking for. We will guide you through the process of selecting the best new furnace for your home. And we will size it for you too to make sure it will keep you comfortable for the least possible cost. Our technicians have experience working will all types of furnaces, and we can integrate your new model into your existing HVAC system if need be. So no matter what type of questions or concerns you have about professional furnace replacement, be sure to give Millie’s a call today. We are always glad to answer your questions or set up an appointment for service.